The 23rd of November is really close and everyone's getting ready for the Black Friday's discounts, our partners are doing it as well! 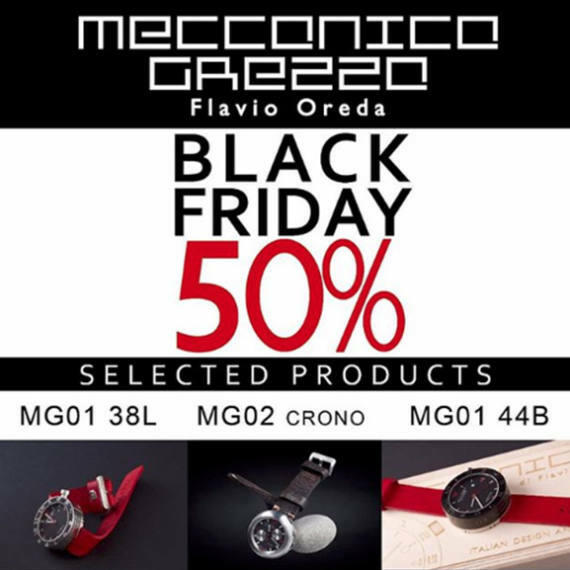 Our partner Meccanica Grezza offers to his clients a 50% discount on the following models: MG01 38L, MG02 CRONO, MG01 44B. The offer is valid from the 23rd of November to the 25th of November 2018, send them an email if you wish to receive the promo code to enjoy this incredible offer! 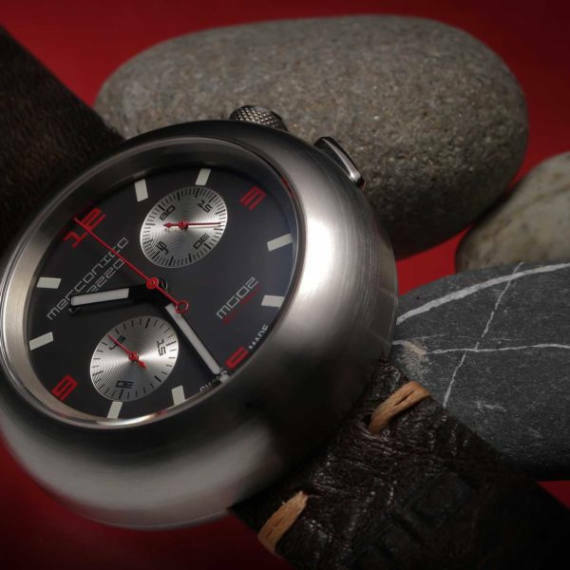 Visit Meccanica Grezza website now. Casing in AISI 316L steel, 38 mm in diameter, 12 mm thick, worked by a solid bar, polished by hand and then engraved with a milling cutter. Bottom made of AISI 316L steel, diameter 38 mm, thickness 6.5 mm, machined from solid with “flange” stop and sealing O-ring blocked with Allen head screws in AISI 316L steel. 2.5mm thick anti-reflective sapphire crystal. Single screw crown with a unique design called “time valve”, made of AISI 316L steel with mechanical processing, then joined to the insert with a unique process; external satin finish for a calibrated anti-breaking socket with dynamometer. 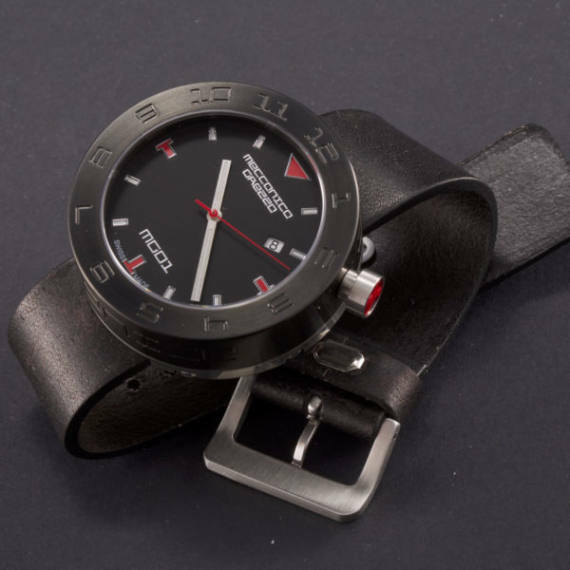 Black enamel dial with applied applied markers in luminova with metal edges. Steel stick hands with central part in luminova. “Ribbon” strap in red cowhide leather, width 20 mm and thickness 2.5 barrel varnished and dyed with vegetable dyes according to ancient Tuscan tradition, subsequently hand-sewn with waxed thread by a master saddler. Buckle in AISI 316L steel machined from solid and engraved with the initials of the brand. 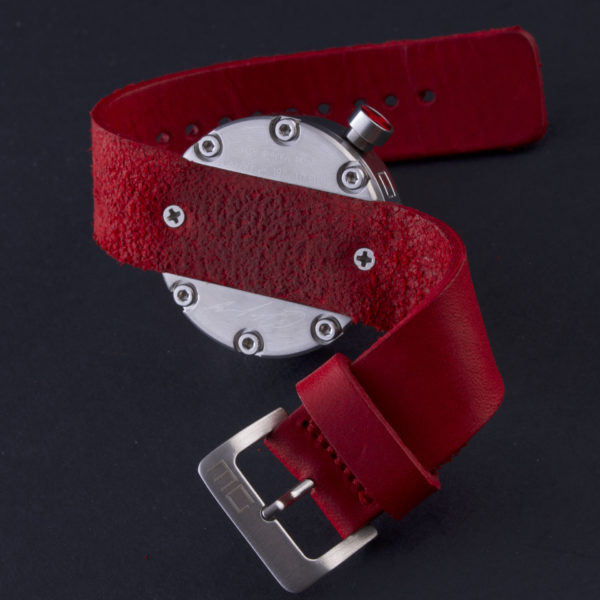 “Ribbon” strap, in thick cowhide leather (2.5 mm), handmade and sewn with waxed thread according to the ancient tradition of saddlers, subsequently fixed to the casing with mechanical coupling. Swiss Made marking on dial and engraved caseback with autograph of the manufacturer and serial number. Swiss automatic movement SOPROD 2045 49 Jewel 28,800 A / h, 4Hz. 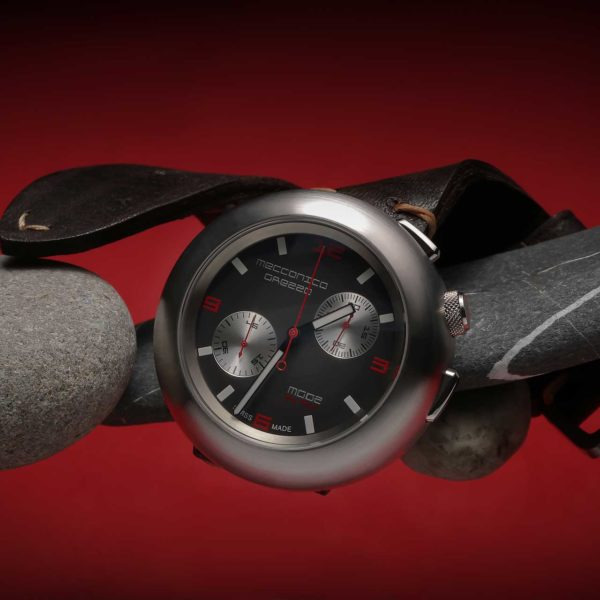 with hours, minutes, small seconds, big seconds and small chronograph minutes on “turned” dials. 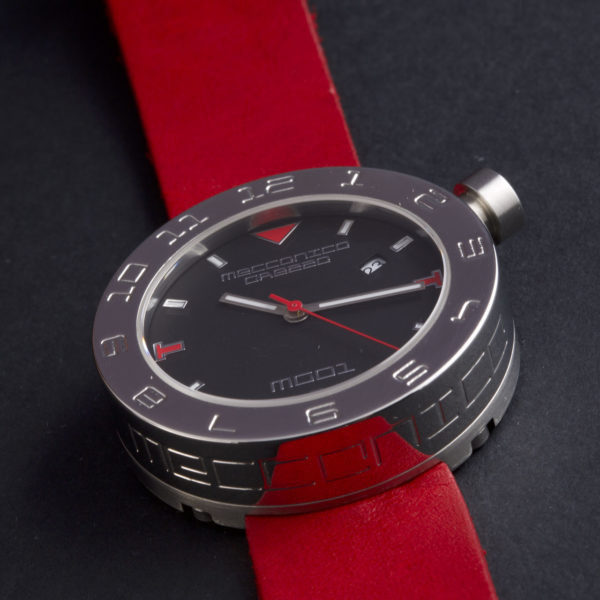 Swiss Made branded watch and water resistant 50m. Casing and bottom in AISI 316L steel, 47 mm in diameter, made of solid, hand-brushed bar, end cap with flange-type seal with hexagon lock. 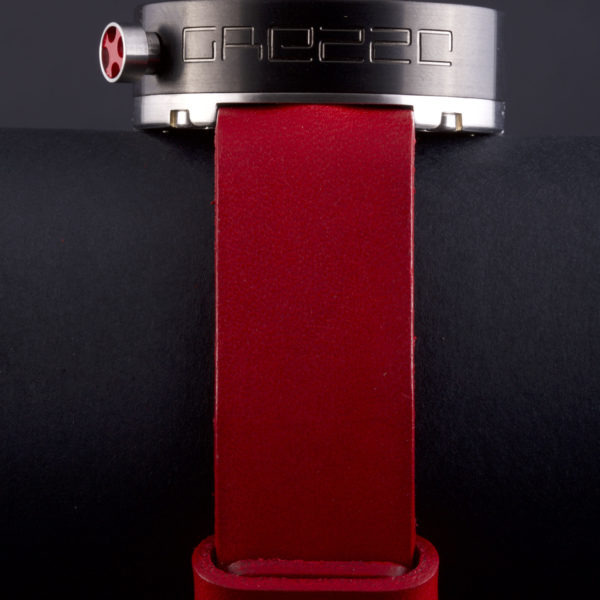 Crown at 2 with exclusive “time valve” design realized for electro-erosion and subsequent enamelling, embedded in the box to be more “organic” possible, chronograph buttons with rounded organic shape inserted in the box and balanced for perfect operation. 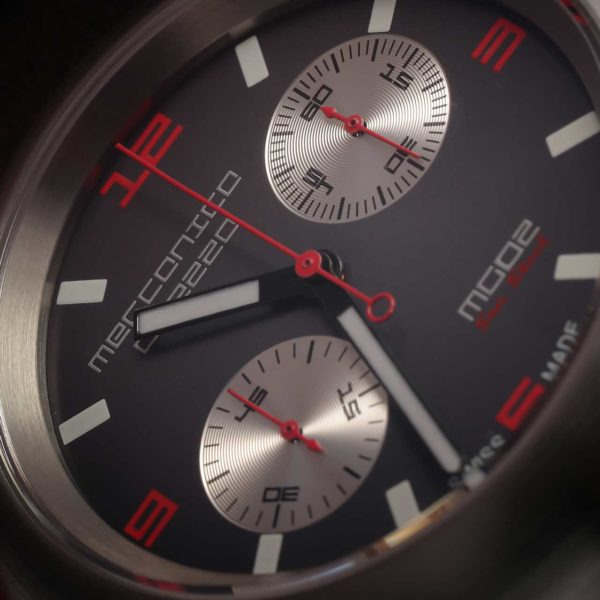 Dial in matt black enamel with luminescent hour-markers and hours reported at 3.6.9 and 12 in red enamel two “turned” rotors at 2 and 8 o’clock for small seconds and chronograph minutes. Curved sapphire crystal with anti-reflective coating. Strap in bull leather, “vegetable brown” tanned dark brown and hand-stitched by a skilled Tuscan craftsman with finishing in waxed thread in contrast. Buckle in AISi steel machined from solid, hand-satined and personalized. Automatic movement ETA 2824/2 11/2 ” ‘lines, 25 jewels, 28,800 vibrations / hour with customized charge rotor and “Cotè de Geneve” finishing. 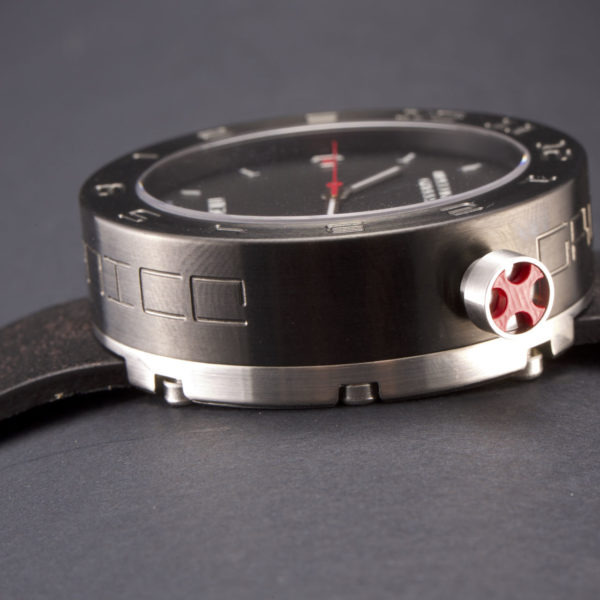 Case in AISI 316L steel, 44 mm in diameter, 13.75 mm thick, worked with a solid bar and engraved with a milling cutter and then finished with an absolute black PVD (Physical Vapor Deposition) treatment. Bottom made of AISI 316L steel, 44 mm diameter, thickness 6.5 mm, machined from solid with “flange” stop and sealing O-ring blocked with Allen head screws in AISI 316L steel. 2.5mm thick anti-reflective sapphire crystal. Enamel dial with raised applied markers made of luminova with metal edges. Steel stick hands with central part in luminova. “Belt” strap in dark brown cowhide leather, width 22 mm and thickness 2.5 barrel varnished and dyed with vegetable dyes according to ancient Tuscan tradition, subsequently hand-sewn with waxed thread by a master saddler. Swiss Made marking on dial and caseback; engraving with serial number and autograph signature of the producer. 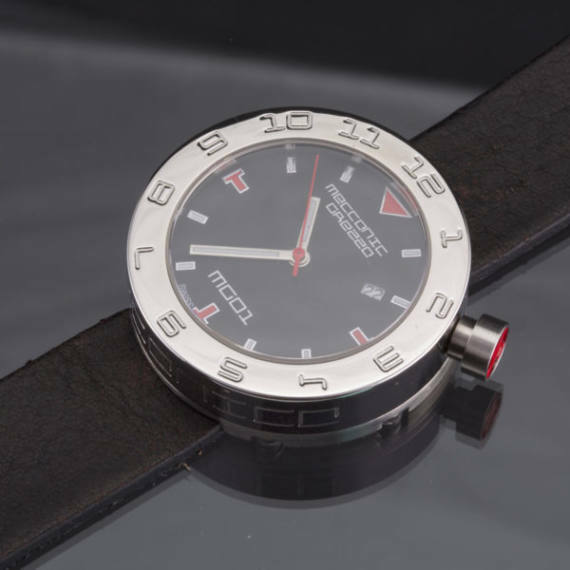 Swiss made watch with 50 m water resistance.